The Afterward is reporting the very distressing news that Gaspereau Press, independent printers & publishers based in Nova Scotia, is significantly reducing their staff and delaying several publications. In these tense economic times this is barely a blip on the publishing-job-cut radar – two and a half jobs eliminated, three books delayed – but for a press of Gaspereau’s size this is significant. With only about a dozen new books offered annually and a future release schedule undecided one can’t help but feel a bit grim about their future. I adore Gaspereau Press. They are among only a few publishers left in the country who print their own books and the results are artisanal. The mission statement on their website – which I encourage you to read – describes their standards but let me add that their books have a tactile quality that is totally unique, marrying letterpress text with handmade papers and inventive presentations. Furthermore, unlike other publisher-presses like The Porcupine’s Quill, Gaspereau offers their printing services and standards to the commercial public. If you need a well-bound, professional and beautiful book printed – say, a catalogue, a journal, or a self-published work – they are one of only two Canadian (along with Coach House Books) options that I am aware of. That does not a healthy local fine press ecosystem make. There’s not much left to be said except to implore you to visit their website and take a good look at their product, and next time you need to procure a well-crafted gift for someone, consider throwing some business their way. I would hate for this latest news to be a herald of the end. The Smart Guy: Hero or Villain? 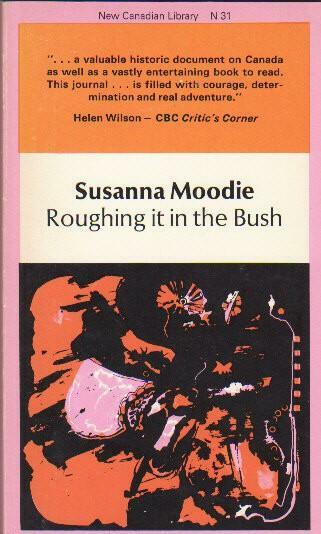 Susanna Moodie’s Roughing It In The Bush, that lonely work of early Canadian literature, has a lot to pick apart for the modern reader. While being generally well written and amusing it is hard to ignore the prejudices of its period that leap off every page. Moodie and her husband aren’t so much “roughing it” as they are “complaining about it”. In an era of cholera outbreaks, crop failures, financial ruins and social upheavals Moodie seems chiefly astounded at how hard it is to find good help in the new world, and at how often her new neighbours swear. By page 160 she finally breaks down and has to do some manual labour herself and seems shocked that there is any virtue in it. Despite professing to have come to love her adoptive country she nevertheless speaks with nothing but disdain for a good number of its inhabitants, the Loyalist Americans and the Irish especially. What surprised me, however, was that the grounds on which she repeatedly claims superiority over her neighbours was so familiar to me. Literacy, she tells her American neighbour. She, Moodie, can expect a certain reverence from her neighbours and her servants not because of her colour, wealth or nationality, but because of her education (putting aside for today the glaring fact that her education is the privilege of her colour, wealth and nationality). It is not very fashionable today to claim superiority over another person for any reason whatsoever, let alone for reasons stemming from socioeconomic happenstance. And yet I can’t help but think that our attitudes towards the superiority of the literate person have changed only in how we voice the attitude: now the uneducated person has our sympathy and our pity, and we feel responsible for raising them up out of their ignorance. The story told by Western literature still goes that the hero, the good guy, is the guy with the book in his hand. This narrative is especially glaring in stories about disenfranchised minorities: the poor, the brown, the unenlightened. Consider two recent, critically lauded examples: Larry Hill’s The Book of Negroes and Peter Carey’s True History of the Kelly Gang. Both books are biographies of heroes who rise beyond their difficult circumstances and score one for the little people, and in both cases the hero is set apart from their peers by their literacy. Hill’s Aminata is as well read as any educated aristocrat and it earns her every protector and defender she has in her story. Carey’s Ned Kelly, meanwhile, is literate enough to write his own history and is depicted as hauling a worn old copy of Lorna Doone through all his trials and tribulations. Reading is a great power wielded by these characters and it is the magic that gives them their break. Of course, literacy is a great power and for that reason it is rightfully identified as one of the pillars of a strong, fair, free society. Yet when expressed by Susanna Moodie as a superiority I find myself questioning my literate person’s worship of the printed word. To what extent is this idea that literate = superior a cultural assumption made by a society which hails the (European) printing press as the pinnacle of civilization? Would we have as much respect for an illiterate hero? How interesting also that the hero of literature is a learned one, while in real life the smart guy is still an object of distrust and ridicule. Neal Stephenson’s Anathem, in one of its more brilliant moments, has a hilarious scene in which the scientist-monks cloistered in their concent (a sort of convent – not a typo) are drilled in the many ways society has vilified and objectified the learned man in order to gain back some power from him. The learned man as wizard. The learned man as conspirator. The learned man as bearer of fire and bringer of Armageddon. We don’t even have to look to literature for precedents (in fact, we’re better off not) – I am given to understand that the President of the country next door takes an awful lot of flack on a daily basis for being smart. Hide the books and the Dijon if you want to avoid being beat up at recess. There seems to be a disconnect between our literati and our popular culture. Susanna Moodie made no headway trying to explain to her American neighbour why her education entitled her to greater respect – the neighbour still felt she was a useless old country lady who wouldn’t survive two winters in Canada. Are our contemporary writers suffering from the same blind spot? Would Aminata Diallo have really won all those allies with her brain for books, or would she have been put down extra-hard because of the impertinence and the threat it represented? Is the bookish hero just a collective fantasy drawn up by bookish people for bookish audiences? 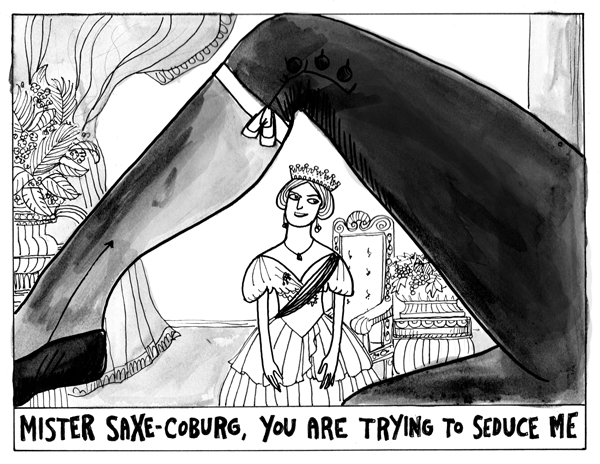 I think Kate Beaton might agree with me that it’s time to bring some Victoria back into our Victoria days. Yesterday afternoon I got an email titled “FW: Congratulations!” Being 99% sure this was another internet lotto spam, I marked it for deletion. But something stayed my hand and I decided to give it a quick glance first. You know, just in case. After picking myself up off the floor I spent the next ten minutes running up and down the stairs viewing the email on two different computers just to be sure. In the meantime my much more level-headed husband opened a bottle of wine and phoned our families for me to give them the exciting news. This was the first-ever National Book Collecting Contest and the only year I would ever be eligible (next year I will be too old). To say I am thrilled beyond description would still be a gross understatement. 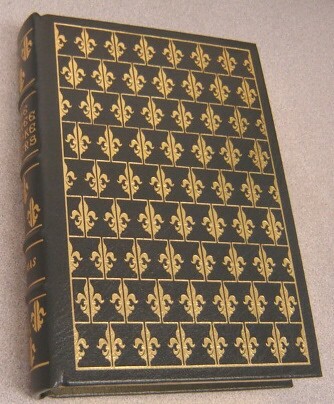 So in celebration of my now-prize-winning collection I thought I’d tell the story of one of my favourite books, the tacky and overlooked Easton Press edition of The Three Musketeers by Alexandre Dumas père. Easton Press published in the 1970s a series called “The 100 Greatest Books Ever Written”, reprints of book club editions bound in leather and pressed with gaudy gilt decoration. These are the kinds of books you might want to decorate a film set with, or maybe your show-library. I doubt very much that many people actually read them, and I certainly believe that Easton Press paid somewhere between little and no attention to picking, editing and publishing them. I recently saw another copy of the book at the Toronto Book and Paper Show and considered seriously buying it in order to have it made into a purse. It’s a forgivable mistake to make. I’m sure the artist went to the library for a reference photo, found young Dumas and went to town, having no idea that there were two Dumases. But what tickles my funny-bone is that for forty years, no one noticed. Not the artist, not the editor, not the publisher, and not a single reader, seller or collector. Why? Because of the nature of the edition: it was never intended to be read by anyone who had a clue. The target audience is people who want to be spoon-fed a library of “classics” that look fancy, without having to know anything about literature themselves. The books are designed to look good on a shelf, not to be read and enjoyed. I admit it, I have an odd sense of humour. But I love this. I just love it. What effort and expense to create a book for looking at. Without a second care for the contents! The history of publishing is full of quirky little discoveries like this, though. It’s the whole fun of collecting: finding those things that are special, that tell a story beyond the narrative printed on the page. Thrilled as I am to have won the inaugural contest, I am almost equally thrilled that one has been established. There is a pleasure to be had here that more people – especially of my generation – could partake of. And what excellent incentive! I have re-enrolled at the University of Toronto in order to tack a major in Book and Media Studies onto my old degree. This was a controversial decision for me; after all, I am already working, blogging, tweaking a novel and trying to raise a 10-month-old. Who has time to go back to school? Well, you know what they say: you can sleep when you’re dead. The course instructor for my summer course has made the very interesting but not unheard of decision to get us all of our assigned readings (120 pages a week worth, I’m told) in digital format. Though her primary motive was to lower our book costs, she also felt it was an appropriate (or maybe she said “topical”?) move in light of the fact that we will be spending some time studying “the death and possible rebirth of the book”. Anticipating any student complaints about having to print the readings out, she recommends to us that we purchase Adobe Acrobat Professional in order to digitally annotate our readings. I have spoken here before about the problem of annotating digital texts. As I mentioned, I keep a stash on hand of journals in order to keep notes on texts so that I don’t have to mark up my books. So, no problem, right? Ugh. Well it is one thing, it turns out, to camp out on my couch with a cup of tea, a book, and a journal to take notes. It’s quite another thing to be tethered to a computer. I have never in my life longed for a laptop before. I don’t want to read in front of my computer. I want to read in my sitting room, or in the garden, or at Madeline’s. And another thing? I don’t understand how anyone can read 50 pages of dry theory in a webbrowser without succumbing to the urge to pull up a tab and check Facebook. That’s a temptation I just don’t need. Good grief. I’d like to reintrench myself as a supporter of actual, physical texts. I don’t care what it costs. This endless list of pdfs is sucking all the pleasure out of reading. The archivist in me (and all book collectors have an archivist in them) is unapologetic. Webcomics are wonderful daily diversions but are also increasingly sophisticated and memorable media. You want to go back to it, reference it, quote it. And while you might be assured that, don’t worry, it’s hosted safely on a server somewhere, I am not. I need to be assured of a thing’s permanence. I need it at my fingertips. One of the quirks of book collecting is how we covet the firsts – first editions, first printings, first appearances, first translations. There is an authority conferred on an “original” text which is lacking in subsequent printings. Nevertheless, in the case of literature that first appeared in another media, bibliophiles tend towards the first book version of a text. Dickens, as we all know, first published most of his novels in monthly installments – little folded blue-green wraps that were issued monthly. And while these little chapbooks are valuable (say $2,000 for all the installments of Nicholas Nickleby) they don’t compare to the first edition of the book (about $13,000 for our Nickleby in book form). The works of my dear Alexandre Dumas follow a similar pattern. Though first published in chapters through a variety of Paris newspapers and journals, collectors don’t form lines for old issues of La Presse, but will pay thousands for the Paris editions of the books (or more for the legendary Brussels editions). Comics, on the other hand, follow an entirely different model. Comic collectors want the first form of a comic, and will even covet first “appearances” of characters in other comics, or sketches on the back of cocktail napkins if they can be shown to be the first time a character took form. Copies of old Golden Age comics will sell for tens, if not hundreds, of thousands of dollars. But the graphic novels – the book-form summaries of a storyline or series of comics – are virtually worthless to comic collectors. Collectors of “strip” comic book artists (such as Bill Watterson) have pioneered this problem for us by becoming hybrid collectors. The collectible entity for a “strip” collector is collections in book form – hearkening back to the Dickens and Dumas collectors – and licensed product, as well as any original sketches they can lay hands on. Collectors of webcomics (and there will be collectors of webcomics, even if just institutions preserving them for research’s sake) have this task doubled in importance. Whereas the source material of a strip comic might always be found in newspaper archives, the source material for a webcomic could very well vanish altogether. The internet feels very big and permanent but in reality it just isn’t. Websites go down and servers crash. Redundancy helps to an extent but the authority of the material is badly damaged when a piece is no longer found housed by its creator. “Photoshopping” a comic is too easy when Photoshop was the original means of production. On that note, collecting anthologies of webcomics is also good fun because, unlike writers who will simply sign their inscriptions, comic artists will draw things in your book for you, which is always extra cool. I overheard a conversation in my local comic book shop recently in which a budding comic book artist was asking the shop owner if he should publish his work in print or online, and the owner recommended “both”. 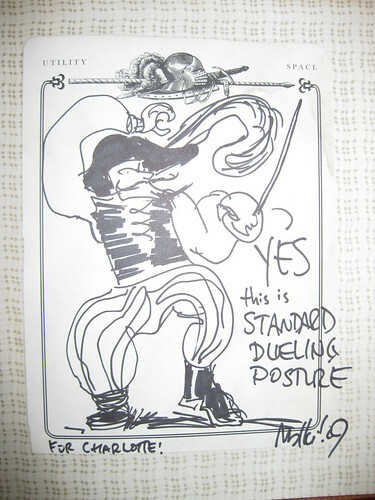 The artist seemed incredulous, but I heartily agree with the assessment. 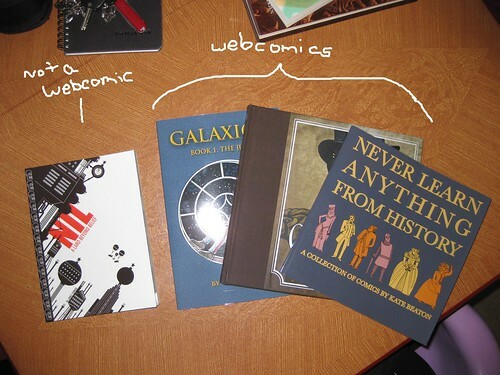 Publishing online is a great way to reach an audience, and webcomics today are exploding in readership and legitimacy. But the print version is essential for posterity, and if done well, will find an appreciative and diligent archival following.